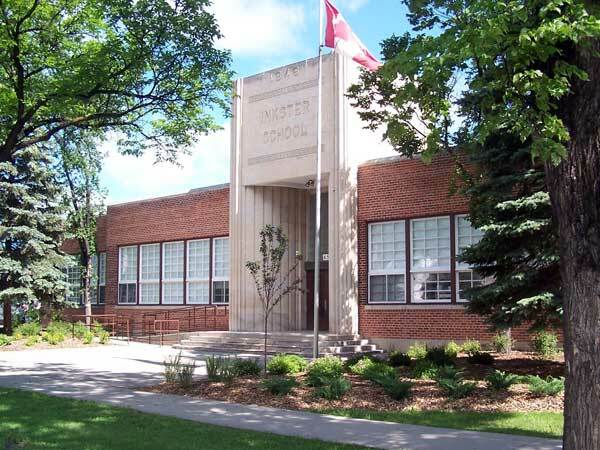 The Inkster School is named for members of the Inkster family who arrived in this region in the early 1800s. Construction started in 1948 following a sod-turning on 18 June presided over by Peter Taraska. The original configuration designed by local architect William A. Martin had eight classrooms and a gymnasium. It opened for classes in November 1949. Four more classrooms were added to the school in 1952-1953 and portable classrooms were brought to the site in 1964 and 1997. A four-room expansion in 1999-2000 included a life skills area, science laboratory, and multi-purpose room. “Majority like idea of school meal plan,” Winnipeg Free Press, 22 October 1974, page 85. We thank the Winnipeg School Division, Nathan Kramer, Henry Sosnowski, and Robert Hill for providing information used here.